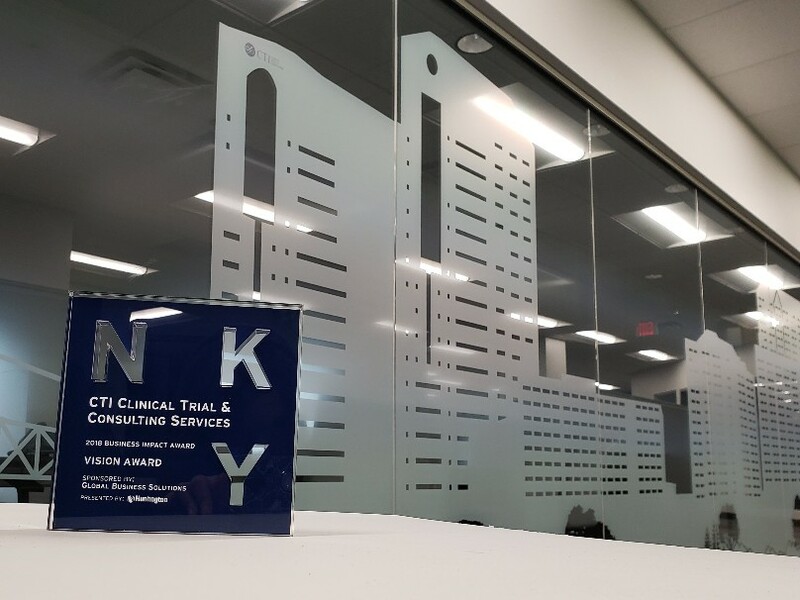 FOR IMMEDIATE RELEASE [Covington, KY ~ [March 29, 2018] CTI Clinical Trial and Consulting Services (CTI), a multi-national, privately held, full-service contract research organization was honored by the Northern Kentucky Chamber of Commerce at the 2018 Business Impact Awards, which were held March 28, 2018. CTI was named the winner of the Vision Award category, which was awarded to the organization for inspiring and delivering new thinking to the marketplace and for showcasing Northern Kentucky as an area of thoughtful, innovative industry leaders. "We're honored to be recognized by the Northern Kentucky Chamber of Commerce with this award for CTI's continued successes and innovations," according to Timothy J. Schroeder, Founder and CEO. "This award is testament to our employees who work at our global headquarters in Covington, Kentucky, throughout the United States, and in over 30 international countries that devote their work to impacting the lives of critically and chronically ill patients around the world through their dedication and passion for developing life-changing therapies." The Business Impact Awards are designed to recognize businesses - small and large, new and long-standing, who are impacting our Northern Kentucky Community through innovation, creativity, strong business practices and leadership. It is a celebration of success and strength of our Northern Kentucky business community. CTI has been working for nearly two decades in the drug development industry across North America, Europe, South America, Pac-Asia, and Africa, specializing in clinical research programs involving critically ill patient populations, and has more than 30 offices worldwide to serve nearly 120 pharmaceutical, biotechnology, and medical device clients. The company moved their global corporate headquarters to Northern Kentucky in 2017.